A healthy pregnancy is the first step towards a healthy baby, so it’s never too early to introduce good habits. 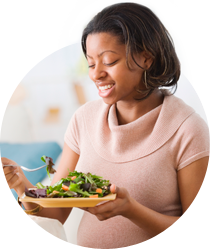 It’s never been more important to eat healthily than when you’re pregnant. After all, what you eat is what your baby eats. Getting the right nutrients is essential to ensure that every day, you and your baby have what you need to develop and grow together. Eating plenty of fruit and vegetables is a great way to get vitamins, minerals and fibre into your diet and it’s even easier than you think – fresh, frozen, dried, canned and juiced all count towards your five-a-day. Also aim to eat wholegrain carbohydrates, some milk, dairy products, meat, fish and eggs. Having this variety of food will mean your baby gets the range of nutrients it needs to help its brain and organs grow. But remember, it is just as important to leave out certain foods when you’re pregnant as it is to include them. Avoid soft cheeses, undercooked eggs, cold cured meat and liver, as well as limiting your salt intake to no more than a teaspoonful – or 6g – a day. Try to cut back on your caffeine intake too. Aim for no more than 200mg a day. That’s roughly two mugs of instant coffee or three small cups of tea. Don’t forget that some fizzy drinks like cola contain caffeine too. 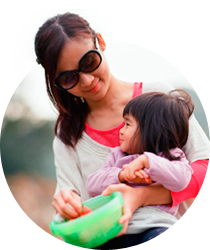 Folic acid and vitamin D are also extremely important for baby’s brain and bone development. It is recommended that mums-to-be take 400 micrograms (mcg) folic acid for the first 12 weeks of their pregnancy to reduce the chance of baby being born with a neural tube defect such as spina bifida. All pregnant and breastfeeding women are also advised to take a daily vitamin D supplement of 10 mcg. As your baby’s liver doesn’t develop until the last month of pregnancy even a tiny bit of alcohol can be damaging. Why not ask a loved one for a relaxing foot rub, or take a gentle walk or curl up with your favourite DVD to help you unwind instead. It’s a common myth that mums-to-be need to eat ‘for two’ and you may well have noticed that your appetite has increased, but you only need 200 calories extra in the final trimester – about the same as two slices of wholegrain toast with margarine. While it may be tempting to indulge in crisps, sweets and cakes, these are all high in fats, sugar and salt. 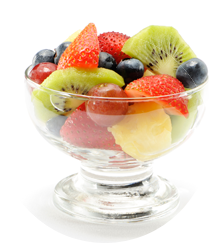 Ditch the choccie and satisfy your sweet tooth with grapes, strawberries, dried fruits and swap ice-cream for low-fat plain yoghurt with fruit. If you’re after a savoury snack, try pitta and reduced fat hummus, plain rice cakes with low-fat cream cheese and homemade plain popcorn. Maintaining a healthy weight may mean fewer complications at birth and your baby is likely to be a healthier weight too. When it comes to feeding your newborn, breast is definitely best. As well as your milk being perfectly made for your baby’s needs, it’s also the perfect way for you to become even closer. Although breastfeeding isn’t always comfortable at first and can take a bit of getting used to, it’s worth persevering, as there are lots of benefits for both of you. Mums’ milk is packed full of disease-fighting antibodies to help protect babies from illness and it changes daily, weekly and monthly to meet their growing needs. Babies who are breastfed are at less risk of developing ear, chest and tummy bugs, eczema, constipation and even obesity and diabetes when they are older. And there are plenty of benefits for mums too, from lowering the risk of breast and ovarian cancer, to helping you lose that pregnancy weight by using up to 500 extra calories a day. It can also save you money – formula costs as much as £45 a month. It takes energy to produce milk for your baby so eating healthily and getting the right nutrients is important while you are breastfeeding. When shopping, make a list of the healthy meals you want to cook over the next week. This means you’re less likely to fill your trolley with things you don’t need, saving you money. For cheap healthy tasty recipe ideas, visit the start4life website. At around six months, your baby will be ready to start eating solid foods. Begin with soft, cooked fruit and vegetables, including parsnip, potato or carrot, mashed banana, cooked apple, pear or baby rice mixed with milk with your baby’s usual milk. Once they are used to these, you can then introduce foods like meat, fish, bread and cheese. Though some shop-bought baby food have ‘from four months’ on them, weaning your baby before they are ready – usually around six months – can increase their chances of getting an upset tummy. Stay in a sitting position and hold their head steady. Coordinate their eyes, hand and mouth, and look at food, grab it and put it in their mouth all by themselves. Swallow food. Babies who are not ready will push food back out so they end up with more around their face than in their mouth! After eight months, your baby should be eating three meals a day. Homemade food is best so you can control the salt and sugar in it. It can be very easy and work out cheaper than buying jars. Save time, money and waste by freezing batches in an ice cube tray for later feeds. Scientific research shows that each day and week that you continue to breastfeed helps to protect your baby against infections and strengthens their ability to fight disease. The longer you give your baby mum’s milk, the more they benefit. Giving them only mum’s milk for about six months, then along with other solid foods after that, is ideal. Now your baby has turned one, they are ready to try full-fat cows milk. Two to three cups, along with three meals a day, plus healthy snacks, will meet their needs. Babies and young children tend to copy their parents so you can help by showing them that you like eating lots of different foods. Eating together is also a great way to help build that bond and get baby used to having regular mealtimes and routines. Meanwhile, avoid giving your baby sugary, salty or fatty foods as it can make them more likely to want them as they get older. If they try lots of tastes and textures, they are less likely to become fussy eaters. There are hidden sugars in foods and drinks that many people think are healthy. So keep an eye on the sugar content of food and drink you give to your baby or toddler. Some foods, like rusks and baked beans, and drinks, like unsweetened fruit juice, cordial, milkshakes and flavoured water, can actually contain lots of sugar. Research shows its best to give them milk and water to drink. And things like fruit, wholegrain toast, plain breadsticks and plain rice cakes instead of sugary snacks. Honey shouldn’t be given to a baby until they are one because it contains a bacteria which can make babies very ill. Always stay with your baby or child when they are eating to make sure they do not choke. Be particularly careful with hard foods, bones, and foods with skin (like sausages). Small, round foods like grapes and cherry tomatoes are best chopped into smaller pieces. Whole nuts should also not be given before five years as they may also cause choking.